Mental health professionals typically rank job loss among the most difficult life events, along with divorce, the loss of a loved one and a diagnosis of a life threatening illness. That’s some serious company. 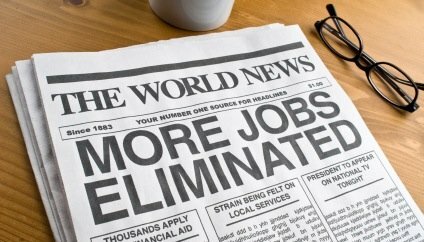 But job loss is also very common, and almost everyone will experience termination at some point in their career. If you lose your job, don’t paint on a smile and claim that it’s the “best thing that’s ever happened to you.” Concealing your emotions can prevent you from facing the reality of the situation. Instead, recognize that you may now be entering a chapter of unemployment. And no matter how short or long this chapter may be, it’s real, and it’s an important and meaningful part of your life story. If you run back into the workforce in sheer terror after a few quiet days (or months), there’s a strong chance you’ll be throwing yourself into a job that’s inappropriate, and your act of desperation will only set you back and keep you from getting where you need to be. So take a deep breath and soak up the following facts that will help you through the process. Be honest with yourself: As painful as it may be, face the possibility that you lost your job for a reason. You may never know exactly what the reason was, but unless everyone in the company was laid off as well, you were chosen for a layoff and the people beside you weren’t. You may have simply been unlucky, but you need to put your ego aside and accept the slim chance that you weren’t. Otherwise, you may step back into an identical position in which you struggle against the same demons and fight the same uphill battles over and over again. Don’t let your loss define youBeating yourself up endlessly for your perceived shortcomings will help no one. If you wouldn’t allow someone to abuse and criticize a loved one the way you’re criticizing yourself, stop doing it. Be fair, and take an objective look at your strengths and weaknesses. Consider other career options If it’s time for a career change, accept this fact and move forward without fear. People change careers and start fresh all the time, and you can too. Visit Livecareer to explore your options and get help. Reach out to a friend or contact who knows more about your prospective career than you do. Use this time wisely: You have a golden opportunity to shape your own future. Nobody’s expecting you to be anywhere ten minutes from now, and nobody’s expecting you to arrive at a certain place or level three years from now either. This is nobody’s life but yours. Think carefully before you make your next move and bring this brief period of complete freedom to an end. You don’t have to talk about your situation or share your true feelings with anyone if you don’t want to. But if you find a trusted listener, you’ll soon realize your problems are neither unique nor insurmountable. Not even close.